Moidart is marked on this map in yellow. The area extends from Glenfinnan in the east, west to Smirisary and includes the Ardnish peninsula. Loch Shiel and the River Shiel to Castle Tioram marks its southern border. This rugged area is part of the Rough Bounds and the railway (in black) only arrived in 1901; until the late 1960s the road marked in red between Lochailort and Kinlochmoidart did not exist, which added to the remoteness and isolation of Moidart. 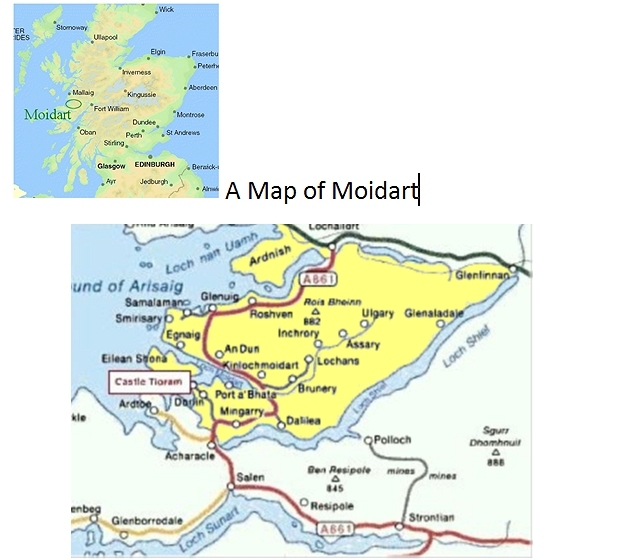 This website deals mainly with the history and culture of Moidart, but other stories and statistics from outwith Moidart are included to give a wider picture of the actions and interactions of people in the general area over the years.